Video games are a 67 billion dollar a year industry and growing. In fact, Forbes estimates that the industry will hit $87 billion in annual sales by the year 2017. One reason for this continued growth is that games keep getting better and better. Just think back to those early Nintendo or Sega days and compare them to a modern day game. Although better does mean new technology with HD graphics, game designers know graphics, gameplay and faster computing speeds are only part of the story. With a little help from his psychologist sister, Jason conducted a study regarding how personality interacted with gamers motivations to play. Using his framing of how these personality traits related to the five domains of play, he was able to make fairly accurate predictions about people's gaming habits based entirely on their five factor model personality report. Pretty cool stuff if you’re a psychologist or a game designer! The only exception to the rule was Neuroticism, which isn’t surprising since this personality trait historically doesn’t quite fit with the other four. Just like with models of personality, it seems that models with four domains of play tend to be more widely utilized, but more on that shortly. So why do we care about predicting gamers' motivations to play this game or that? We certainly aren’t going to give a 240 item personality test to every person who wants to buy a game. We care because understanding the individual differences that drive people to play different games can be a powerful tool when designing a game that you want to appeal to a wide range of people. 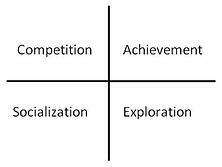 This was the thinking behind the Bartle Test of Gamer Psychology which is a short test to determine a preference order of four gaming characteristics (competition, socialization, exploration, achievement). Furthermore, game designers have discovered that the most successful games are those can effectively satisfy all four of these domains of play. This means, the more deeply they can understand each of these domains, and the human drives behind them, the more successful they will be in their design efforts. For this task, I turn to the FEBI, the most useful tool in understanding leadership behavior I have ever come across. Just as Jason compared the five factor model of personality to his model of gamer motivation, we can easily see how FEBI relates to the four domain model above. Those with a strong preference for the Driver energy pattern will gravitate to games that are competitve, challenging and high intensity, such as Call of Duty or Gran Turismo. Those high in Organizer will prefer games that track progress and reward achievements, feeling compelled to solve all the riddles in Arkham City and get all the coins in Mario. 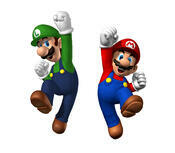 Those high in Collaborator will play games that involve other people such as oline gaming or Wii Sports Resort. Those high in Visionary will play games that let's them explore, such as creating new levels in Little Big Planet or exploring Lego City. If game designers can deeply understand the essense of each of these energy patterns of FEBI, they will be better able to design games that appeal to the unique drives and motivations of each of these patterns. Game design certainly isn't the only application of the FEBI energy patterns. Indeed, game design is increasingly informing e-learning platforms, which are expected to become the dominant mode of workplace training and development within the next decade. 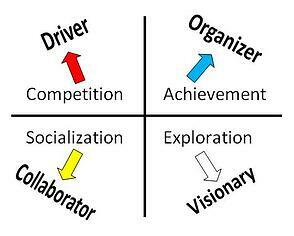 Moreover, there are numerous applications of these same patterns to the everyday work of leaders and managers. We recently published a handbook that outlines 26 of these applications - one for each letter of the alphabet, called (not surprisingly): The ABCs of Energy-Based Leadership. Click HERE to read more about the ABCs and view the list of topics covered in the book. Any number of them could be just the ticket to improving your game.